Venezuela’s borders were closed at midday Saturday and will not reopen until 11:59 pm tonight [Sunday]. 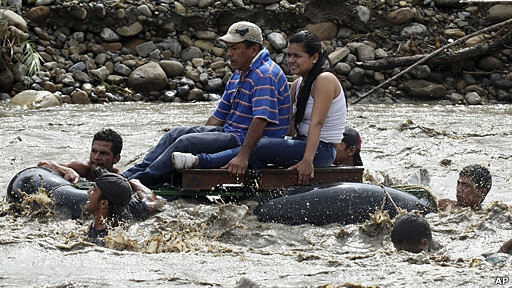 Nevertheless, some braved the strong waters of the Táchira River this Sunday, in order to vote. For the last few hours I’ve been hitting refresh on Mundo’s blog and watching the flickering, fast-moving and frustratingly speculative flow of tweets with Lanata’s Periodismo para Todos on in the background. #ComiendoUñas indeed (biting my nails). I was feeling shirty and anxious. #WeAreVenezuela RT @jeffersonparada: They crossed the Tachira River just to exercise their right to vote. There was a historic turnout and enormous participation amongst Venezuelans living overseas. That, at least, is a triumph for democracy. Here’s hoping the elections are clean and the elected president manages to unite a divided country. #WeAreVenezuela. I wish you all well. Edited 10 minutes later to add: So, that’s it. Chávez 54%, Capriles 44%. Enormous turnout of 80.4%. I’m incredibly disappointed. May the opposition remain united and strong: this was an inspiring practice run for 2019. Let’s all pretend I’m not a day late, shall we? According to the Latin American Corruption Survey 2012, corruption seems to be down – a little – in the region. Nevertheless, 44% of respondents said corruption was an obstacle for doing business, and 52% believed their company had lost business to a competitor that offered illicit payments. Some interesting data here. I’m not sure how I feel about this one: Wikipartido plans to change politics in Mexico. On the one hand, any mechanism for increased grassroots political participation is a good thing; on the other, I have visions of a directionless, incoherent political party responding to the short term ebbs and flows of public opinion. Is the International Criminal Court Facing Its ‘Black Hawk Down’ Moment? Great read. Important issue. Breathtaking example of the politicization of international law and human rights. With the announcement of Argentine president Cristina Fernández de Kirchners, new housing plan, the topic is on everyone’s lips at the moment. I’m not going to touch the debate on whether handing out cheap mortgages is a responsible use of the country’s pension funds, at least not here and not today. Rather, in a more general sense, El Diplo offers an interesting analysis (although the best is behind a paywall): start with Las Mil Caras de un Problema Compleja (spanish) and this infographic (portuguese) calls attention to the scale of the problem across the region. And it’s absolutely no fun being a woman in Mexico. I returned my Overseas Elector form to the Australian Electoral Office today. I’m not living in the country, and I have no plans to move back in the foreseeable future. Should my opinions on tax, health care, and energy policy really count as much as someone who is affected on a daily basis by federal government decisions? In addition, many of my opinions on said policy areas are uninformed. I left Australia a year ago and have barely glanced at the headlines since. I get my online news fix from UK and US sources, and curl up with the Peruvian papers on a Sunday. My knowledge of goings-on back home is based almost entirely (and this is embarrassing) on Facebook status updates. Although my instincts as a woman, an atheist and a liberal all pointed me toward Julia Gillard (Australia’s now-PM), I was not informed in any meaningful fashion about the policy stances of either candidate. I don’t believe in an uninformed vote. Writing this, I was trying to wrap my head around something that had been niggling at me for a while. Does this leave me in some kind of expat political vacuum? Divorced from the political life of my home country, while unable to contribute my political voice to that of the place where I work, run a business and pay taxes? I felt like there was something more to democracy than just the vote – as important as this is – and that different kinds of political participation were more relevant and exciting to me, as an individual, at that moment of my life. Building a new life for myself in Peru, simply being an expat, was something I saw as a political act. If Ms. Luxford has the time to make these lengthy defenses of her abdication of her civil responsibilities, she has the time to read a few articles from the Sydney Morning Herald to keep abreast of affairs at home, and register her vote at the embassy. If Ms. Luxford’s expatriation is to be considered a political statement, it may only be considered so if she also votes, since she is afforded that great opportunity and responsibility. To Matador’s publisher and editors: Every time you publish articles that encourage apathy toward participation in the political process you diminish the luxury you enjoy of a free press. I didn’t agree with John at the time, and I still don’t. So why the change of heart? This week’s Economist has an interesting little article on Diaspora politics: Returning Officers. Many states allow emigrants to cast absentee ballots in their home constituencies. But migrants argue that fully fledged representatives defend the diaspora’s interests better. France’s global voters worry particularly about issues such as consular services, the state funding of French schools abroad (such as lycées) and taxes on earnings abroad. Julien Balkany, a candidate standing in France’s new North American constituency, says emigrants want champions back home, so that they can return to a society that values their international experience, not one that sneers at their globetrotting. I’m still uncomfortable about voting for a representative in an electorate I don’t live in. I have an interest in and am affected by many Australian domestic and foreign policies, obviously, but the quality of my citizenship is different – not better, or worse than, but different – than that of an Australian living in the country. I’m enrolled in the electorate of East Melbourne where I happened to be living during the last election I spent in Australia. I have no family there and will probably never live there again. Should my vote have the same weight as someone who does live there? A representative of my very own, representing my particular interests as an Australian citizen living outside the country and planning to do so for the forseeable future? Interesting idea. Still, this isn’t the case just yet. In fact, the situation has changed very little since I wrote that article for Matador. I still rarely make the effort to follow Australian politics: I work, study and try to keep a handle on what’s going on in Peru, where I still own a business, and Argentina, where I’m building a life. I won’t apologize to John for not finding time to browse the Herald from time to time. But I have also become more keenly aware of the responsibilities of citizenship, and that wonderful if arbitrary luck I had to be born an Australian citizen. Australia has legislated compulsory voting. I believe there are much better ways to develop civic virtue, and I’m not convinced I should vote for a non-representative Representative. But, as I preached in a recent article on insecurity in Latin America, society ought to see laws as self-imposed restrictions put in place for the good of all. I may still decide not to vote, and while I’m overseas I am still exempt. But I’m less certain that I was a year ago about what the right answer is.